Waterford FC head into the mid-season break with a two-point lead at the summit of the First Division table after a stunning 6-1 win against Athlone Town in the Athlone Town Stadium. The Blues were keen to make amends after a shock opening weekend defeat against Athlone Town, but those demons were banished in just the 8th minute as John Martin, with two superb starts to his name in successive weeks previous, racing onto a Garry Comerford pass to fire past Town keeper Igor Labuts. Colm Coss almost levelled for the home side on the quarter hour, but the Blues weren’t hanging around and made it 2-0 after 18 minutes. A downfield ball from keeper Matthew Connor was flicked on by Mark O’Sullivan into the path of Martin and he grabbed his second goal of the night. Mark O’Sullivan went close as the Blues looked to add a third but Labuts saved well, before at the other end Blues keeper Connor had to be alert to make an excellent save from Jason Lyons. The Blues made it a 3-0 cushion at the break with a goal of real quality. Anthony McAlavey played a smart one-two with John Martin in the middle of midfield before playing an exquisite ball from the outside of the foot into the path of O’Sullivan. The striker used his quality to round Labuts and fire into the empty net. Kenny Browne almost scored from 40 yards at the start of the second half before David McDaid got on the scoresheet. Mark O’Sullivan’s cross was deflected toward goal by Athlone defender Joe Dwyer and McDaid was on hand to fire home. As the hour mark passed, The Blues made it 5-0 as John Martin fired a confident penalty kick past Labuts to complete his hat-trick into the bottom right corner. 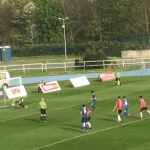 The Blues conceded a first goal in 494 minutes of football in the 90th minute as Walter Invernizzi tapped home from Lyons cross. But the Blues put the gloss on a superb win in the 94th minute as Dean Walsh brilliantly rounded Labuts to slot into an empty net to make it 6-1. Athlone Town: Igor Labuts; Niall Scullion – Joe Dwyer (Ethan Keogh 58′) – Kirils Grigorovs – David Brookes; Jason Molloy (Dragos Sfrijan 46′) – Colm Coss – Jose Viegas – Conor Barry (Ryan Gaffey 73′); Jason Lyons – Walter Invernizzi. 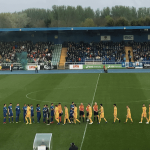 Waterford FC: Matthew Connor; Conor Whittle – Kenny Browne – Patrick McClean – Shane O’Connor; Garry Comerford – Anthony McAlavey – John Martin (Gary Delaney 75′); Derek Daly (Kenny McEvoy 69′) – Mark O’Sullivan (Dean Walsh 52′) – David McDaid.